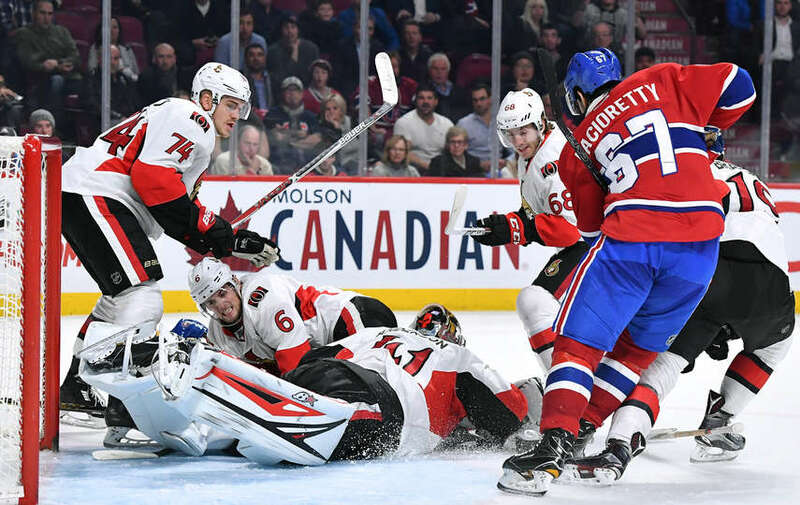 MONTREAL — Mike Hoffman and Mark Stone each had a goal and two assists to help the Ottawa Senators to a 4-3 win against the Montreal Canadiens at Bell Centre on Tuesday. It was the first regulation loss of the season for Montreal goalie Carey Price (11-1-1), who made 19 saves. Derek Brassard and Erik Karlsson scored for the Senators (11-7-1), and Craig Anderson made 36 saves. Shea Weber, Alexander Radulov and Alex Galchenyuk scored for the Canadiens (14-4-2), who are 11-1-1 at home. After Galchenyuk scored the Canadiens’ second power-play goal of the game at 2:08 of the third period to give Montreal a 3-2 lead, Stone and Karlsson scored 2:24 apart to give the Senators their first lead of the game. Stone tipped in a pass from Brassard from the edge of the crease at 3:13 to tie it 3-3, and Karlsson scored through a screen at 5:37 to make it 4-3. Weber scored his Canadiens-leading seventh power-play goal to put Montreal ahead 1-0 26 seconds into the second period. Weber’s goal ended Ottawa’s streak of 35 successful penalty kills in a row since Oct. 22 (4-2 loss against the Tampa Bay Lightning). It also was the 14th time in 19 games this season the Senators have given up the first goal. It was the first time the Senators scored three or more goals in a game since Oct. 25 in a 3-0 win against the Vancouver Canucks, and the third goal in that game was into an empty net. It’s the first time since Oct. 18 they scored at least three goals in a game on a goalie (7-4 win against the Arizona Coyotes). Karlsson had the 400th point of his NHL career in his 498th game when he assisted on Hoffman’s power-play goal at 5:22 of the second period to tie the game 1-1. Canadiens defenseman Nathan Beaulieu left the game at 15:19 of the second period after getting hit in the throat area with the puck.